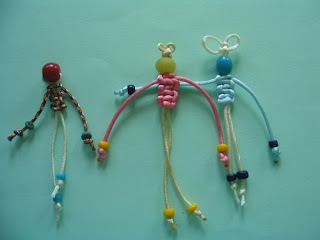 The heads are made from monochrome old Chinese and Indonesian glass beads.For the feet and hands I use seedbeads with a couple of ancient trade wind beads for the hands of the left dolly. The flat knot is used to make the doll's bodies. I got the pattern from a Chinese knotting book.